Mark your calendars for July 31st and August 1st, 2010, and join the manufacturers and diehard Chileheads who make the pilgrimage to Jungle Jim’s annual “Weekend of Fire”. The annual event is held inside The Oscar Event Center, located adjacent to the Jungle Jim’s six and a half acre megastore in Fairfield, Ohio, just north of Cincinnati. This year we are planning something bigger, hotter, and even more fun. Prepare yourself for up to 75 booths of hot sauces, barbecue sauces, salsas, marinades, mustards, jerky’s, peppers and more from the all across the USA. Also, be sure to check out the latest episode of the HotSauceWeekly podcast, where we talk to Jim Beckett and Tom Hann from Jungle Jim’s! Definitely looking forward to this event. It’s always a ton of fun! That’s a great banner that Scott Roberts put together. 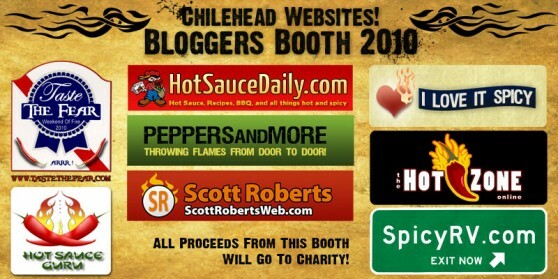 Thanks for all you do for the HotSauce bloggers of the world, Scott! And Brian, the interview with Jim and Tom from Jungle Jim’s really went well…considering I wasn’t there to help :-). While we cannot sell at the show, we are going and will be bringing some bottles for the bloggers! Awesome, Jay! Looking forward to meeting you.